Take a Virtual Tour of the hotel.Welcome to the Holiday Inn Express Hotel in Fremont-Milpitas . CA The Holiday Inn Express is conveniently located just off the 880 at Mission & East Warren Ave amidst many of Silicon Valley's Corporate Headquarters including Cisco, Seagate, and NUMMI. 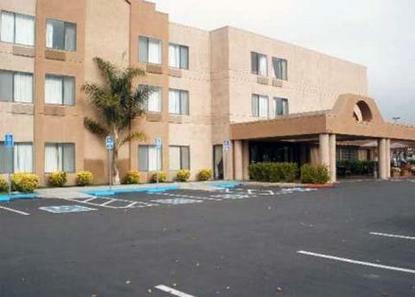 We are also convenient to Great America & the Santa Clara Convention Center. Make our hotel your home away from home and enjoy our outdoor pool and spa, fitness room, and 24 hour business center. All our rooms are equipped with free fast Internet access, free printing service from rooms, free local calls, two line phones, ergonomic desk chairs, refrigerators and microwaves.Join us each morning from 6AM-9:30AM for our complimentary Express Start Breakfast with cinnamon rolls and Smart Roast Coffee. You will love our comfortable Great Rooms and upgraded amenities and service throughout the hotel.You will be assured a smart, comfortable and affordable stay while traveling on business or pleasure. From the moment you enter the lobby, you will be welcomed with warmth by our courteous and friendly staff. You will find this as the best value in the East Bay. We hope you join us soon We are proud members of the Rainbow Chamber of Commerce Silicon Valley and are a TAG approved hotel. This hotel is committed to providing accessible facilities under the American Disabilities Act. If your accessibility needs are not met, please contact the Hotel Manager on Duty. Should you require additional information regarding accessible facilities for guests with disabilities, please call 1-800-Holiday (U.S. and Canada) or contact the hotel directly. For the hearing impaired, TDD service is available at 1-800-238-5544 within the U.S. and Canada.